Jeng Jeng Jeng!!! Panda Foong take note! I got my Angry Bird plush toy! :P Ok-lah, tell you the truth, I tak dapat yet! That picture above? Is my cousin, Carolynn ‘s mommy punya. So head down to Ikano NOW and get your plushies people! Exactly which store you ask me? I asked my cuz and this is her reply..
Aaa-hee-yah! You missed… Snort! Snort! i want angry bird plushie too!!! errr… sorry, terpost comment using kel's id… hehe! I went there, saw the Angry Birds, talked to the girl selling the Angry Birds, walked out empty handed. LOL!! I think I will stick with my Panda Head for now. LOL!! Cute, Merryn… road bullies, beware!! Oh dear, if I have it, my daughter sure scare to see the bird's angry face. my..look at its angry face! 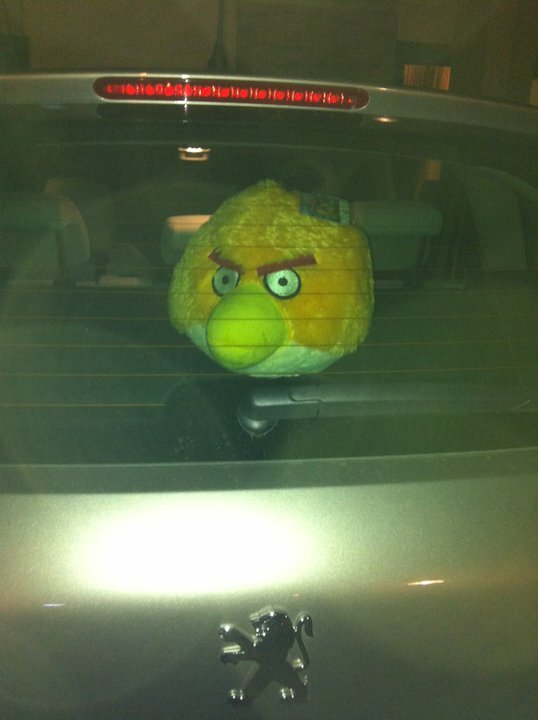 haha wat a cute angry bird plushie.